AP/Getty/Business InsiderTesla CEO Elon Musk and rapper Azealia Banks. The rapper Azealia Banks claimed that she spent the weekend at Elon Musk’s house, setting social media ablaze. Banks told Business Insider she saw the Tesla CEO at home “scrounging for investors” after tweeting last week about plans to take Tesla private. Musk’s representative told Business Insider he could not comment on funding. Tesla declined to comment. 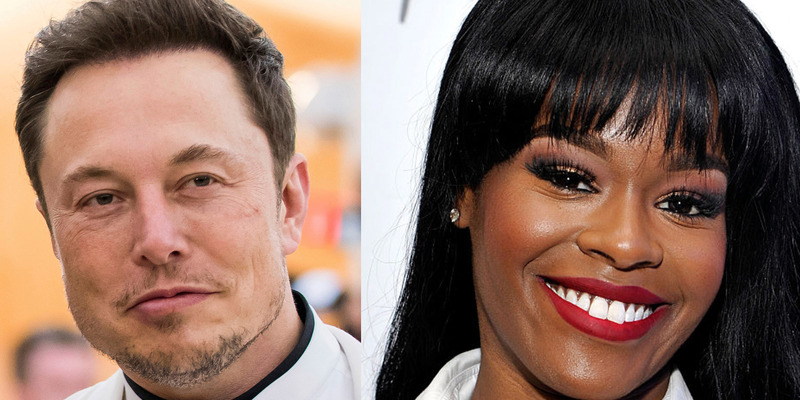 Azealia Banks lit up the internet after saying in her Instagram Stories that she was at Elon Musk’s house for the weekend. When Business Insider reached out to Banks via Instagram direct message, Banks shared further details. She said she arrived at one of Musk’s homes in Los Angeles early on Friday and left on Sunday night. An independent secondary source confirmed that Banks was at one of Musk’s properties over the weekend. Over the course of the weekend, Banks said, the couple essentially went into hiding as Musk – who had tweeted earlier in the week about plans to take Tesla private and said funding was “secured” – sought funding. But Banks said the couple kept stringing her along with the promise of collaborating on music. A spokesperson for Musk told Business Insider in an email that “Elon has never even met Ms. Banks or communicated with her in any way,” but did not deny that Banks had stayed at one of Musk’s properties over the weekend. Tesla declined to comment on Banks’ claims about Musk looking for investors. On Monday, Musk said in a statement on Tesla’s website that he used the phrase “funding secured” to indicate that he believes there was “no question” that Saudi Arabia’s Public Investment Fund would provide funding to convert Tesla into a private company. A representative for Musk referred questions about Tesla’s funding to the company, which declined to comment. 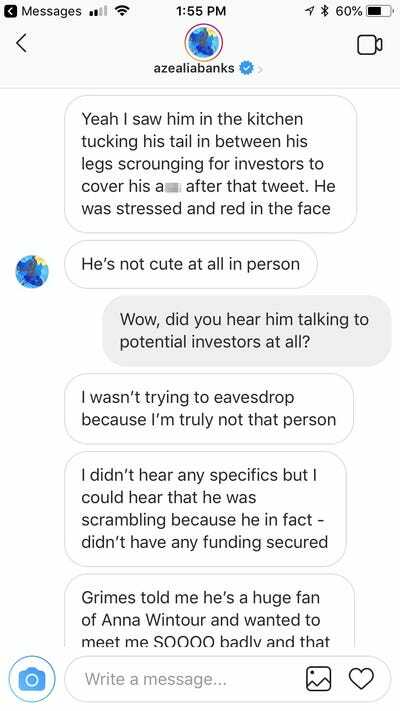 Boucher also did not respond to a request for comment, and neither Musk nor Boucher responded to Banks’ claims on social media. “I could run Tesla better than he does,” Banks told Business Insider of Musk.